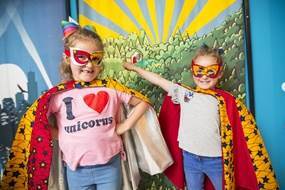 Seven Stories is the National Centre for Children’s Books with unique exhibitions, engaging storytellers, visiting authors and fun activities for all ages. It is located very close to where we live in the Ouseburn Valley, just outside the centre of Newcastle upon Tyne, and is housed in a former grain and flour warehouse with a tremendous riverside setting. We have been to Seven Stories so many times, but did you know that as well as books and exhibitions, it often has art and illustration workshops too? The engaging exhibitions at Seven Stories are great and the boys love them. Read here about our recent visit to Comics. There are plenty of play opportunities too, from dressing up to the train table, and my boys always enjoy the craft activities that are found throughout the building and especially in The Studio. If you haven’t been to Seven Stories, you enter, and exit, on Level 3. 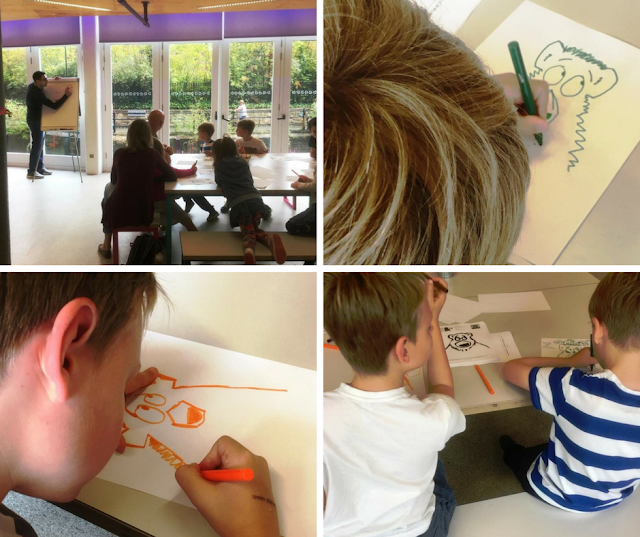 On the very bottom floor, which is actually Level 1, you’ll find The Studio which is a perfect place for families to draw, paint, write, make, doodle and build together. From The Studio, you also get one of the best views of the boat sculpture called 'Sea Song Sang' which is moored out the back of the Seven Stories Centre for Children's Books, on the Ouseburn itself. I haven’t been to a workshop at the award-winning museum since my eldest was just a toddler, but we were invited to attend a couple recently and I’m so glad we went along. The boys had a great time. The workshops were both themed on the ‘I Am Bear’ picture book, which is aimed at children 3+ with funny wordplay and bold imagery. It is illustrated by Sav Akyuz, who was also hosting the workshops. The book was only published last year and is aimed at a younger age group than what my boys now are, so we hadn’t read it or even seen it before. But this didn’t matter at all. We first headed to the bookshop at Seven Stories and looked at the book on display before heading to learn to draw. If you haven't been the Seven Stories bookshop is a lovely place. Although part of the museum in the Ouseburn Valley, it can be accessed without paying admission and is a perfect place to shop for both birthday and Christmas presents. However, back to the workshops. First of all, we went to ’How To Draw a Bear’ which was a free workshop (admission to Seven Stories was required) aimed at children aged 4+. Held in The Studio the coolest bear in town needed some new costumes for his adventures and illustrator Sav Akyuz was there to help my boys and the other children (and some parents) design them. The children were sat around big square tables, similar to what they’d experience at school, and Sav stood in the middle drawing Bear on a flipchart, but not just drawing. He carefully explained how he drew each part of Bear and the workshop attendees recreated their own bear at the same time. The kids, and adults listened and he had a great way of clearly explaining what he was drawing, engaging the fairly young children. Sav also took the time to go around and talk to each of the children, offer suggestions and just chat to the children. 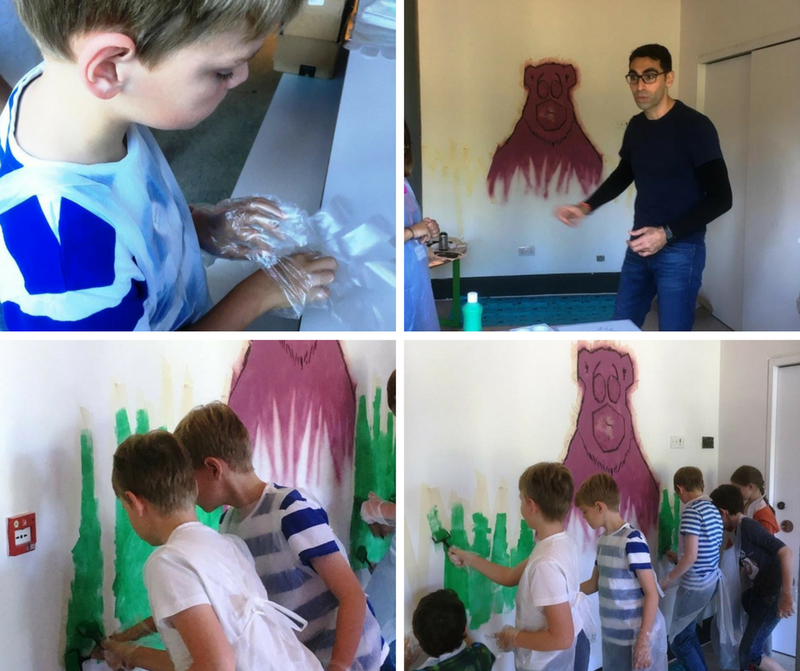 Our second workshop for the day was graffiti art and stencil making, and this one was aimed at slightly older children, those aged 7 and over. Perfect then for my boys, currently 8 & 10. Back in The Studio with Sav, there were a smaller number of participants to try the two different activities -Graffiti Art and Stencil Making. First, they started by making stencils. Sav not only explained how unimportant these were to creating art but was also really good at providing activities with the right level of difficulty for the different ages taking part. 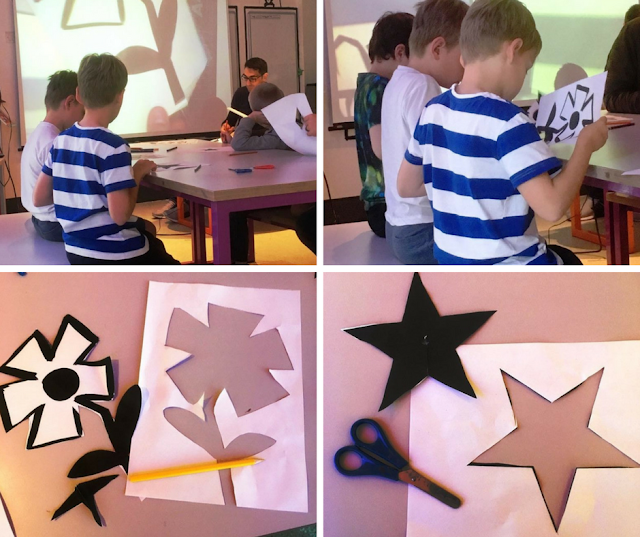 There were easy and difficult stencils to cut out, and the children helped each other as well as seeking help from Sav, himself. It was really lovely to watch. They then went to use the stencils that had been cut out to create a giant bear on the wall at Seven Stories ‘graffiti’ style. The kids put on safety clothing before using spray paint to add details to Sav’s bear mural already draw on the wall. Each took their turn and they all looked really happy as well as totally engaged in the project. In between the workshops, we had time to watch a comedy show up in the attic on Level 7. This was really good fun and the boys couldn’t stop laughing. Then we popped into the Café on Level 2 for a quick cuppa and cake too. Both workshops were really good and the boys are very much looking forward to going to more. 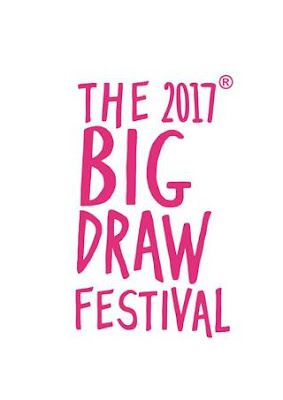 Get your marks moving, as part of this year’s Big Draw Festival as Seven Stories and the team from CoMusica Arches present a day of fun and lively drawing. 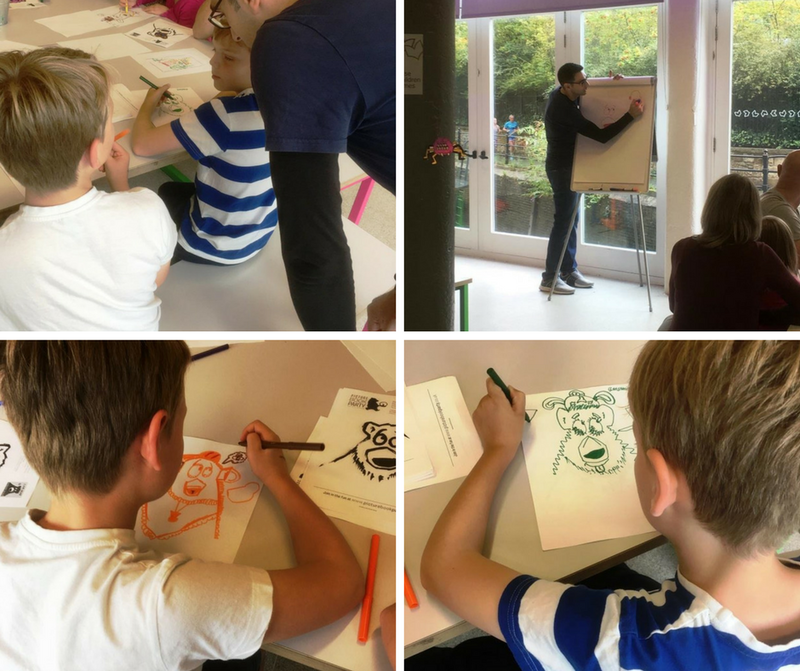 Join local street artists, watch as art comes to life and discover the joy of drawing at this animated and enjoyable art workshop! Aimed at children aged 5+. £3 per person. Admission is required to visit the rest of Seven Stories. 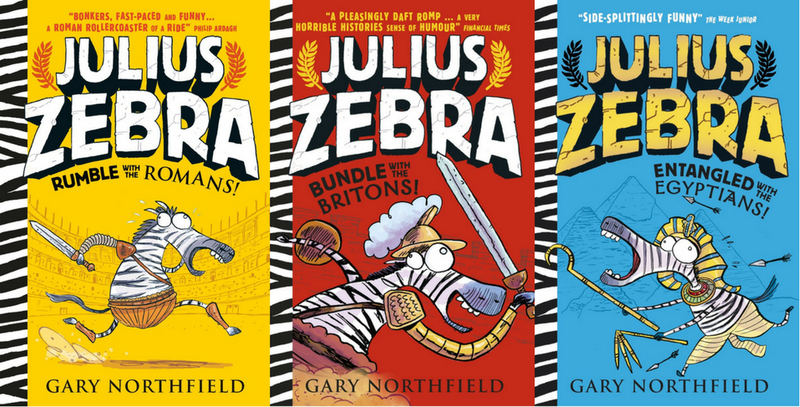 Master cartoonist Gary Northfield (The Beano, The Dandy) will have you laughing out loud as he introduces the hilarious world of Julius Zebra. Julius is no ordinary Zebra – he’s a Roman Gladiator, and this time he’s been shipwrecked in Egypt and mistaken for a Horse God! Full of fascinating and creepy facts about the ancient Egyptians – all based on real research – you’ll discover gladiators and Egyptian Gods, learn how to draw your very own Julius Zebra, and get loads of cool tips from Gary on how to be a cartoonist. Recommended age 7+. £3 per person. Admission is required to visit the rest of Seven Stories. Join our Story Catchers and Team Juice for a jam-packed day of comic activities for all the family! 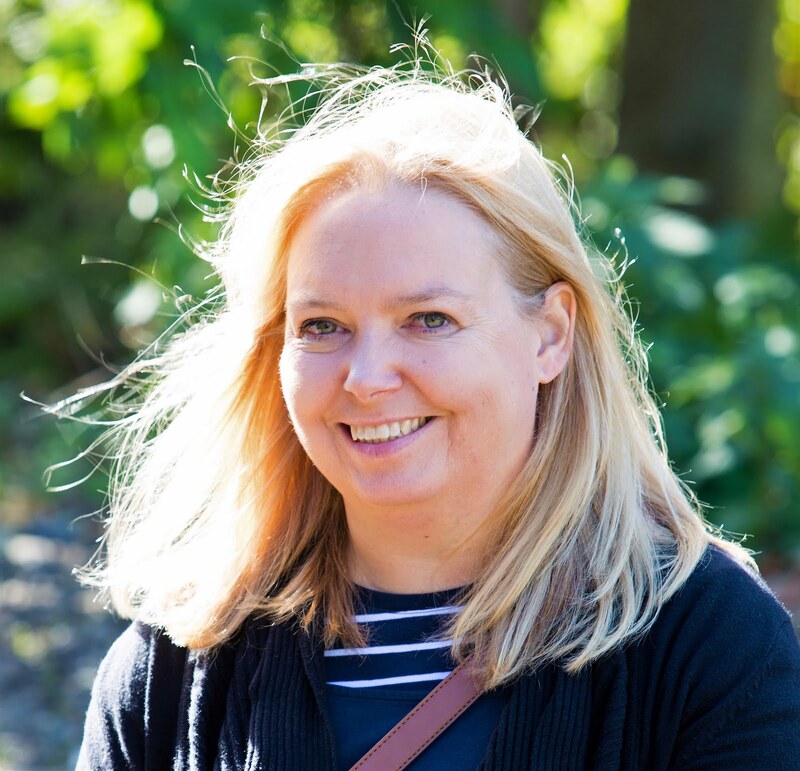 Curated by comic artist (and all-round comics expert) Lydia Wysocki the one-off Comic Takeover promises the opportunity to meet comic artists, make comic art, swap comics and find out more about latest exhibition Comics: Explore and Create Comic Art. Presented as part of Juice – NewcastleGateshead’s award-winning festival for children and young people this event is free with admission. 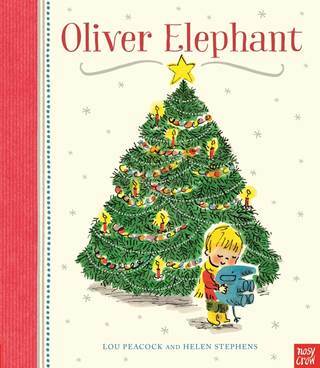 Join illustrator Helen Stephens as she reads, and draws, from her new book Oliver Elephant, the story of a little boy Noah who loses his very beloved toy elephant on a shopping trip. Draw along with Helen too and don’t forget to bring your own special toy along, but be sure to keep them safe with you on the journey! Aimed at children aged 3 – 7, booking is essential. £2 per person, Admission is required to visit the rest of Seven Stories. Zoom off into space for an adventure where YOU CHOOSE what happens next. Which alien would you most like to be friends with? And what fantastically freaky food will you decide to munch for lunch? 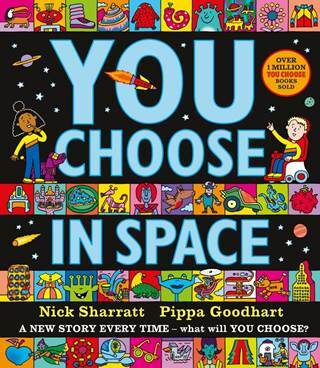 Join author Pippa Goodhart and illustrator Nick Sharratt as they celebrate new book You Choose in Space, which is dedicated to Seven Stories! Head on up into the attic to hear a very special reading of the book, to play space-themed games and to draw-along with Nick. Grown-ups, please bring paper, colouring pencils and something to rest on with you. Fancy dress encouraged - astronauts and space monsters most welcome! Booking essential. £5 per person. Admission is required to visit the rest of Seven Stories. 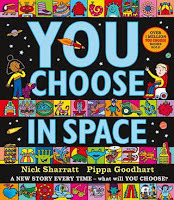 To celebrate the publication of new book ‘You Choose in Space’ illustrator Nick Sharratt (no relation to me that I know of) and loyal Seven Stories supporter hosts an event looking at his book cover designs. Hear Nick talk about his working process and portfolio to date and watch as he demonstrates his talent for drawing before trying your hand. Booking is essential. £7 per person. Admission is required to visit the rest of Seven Stories. 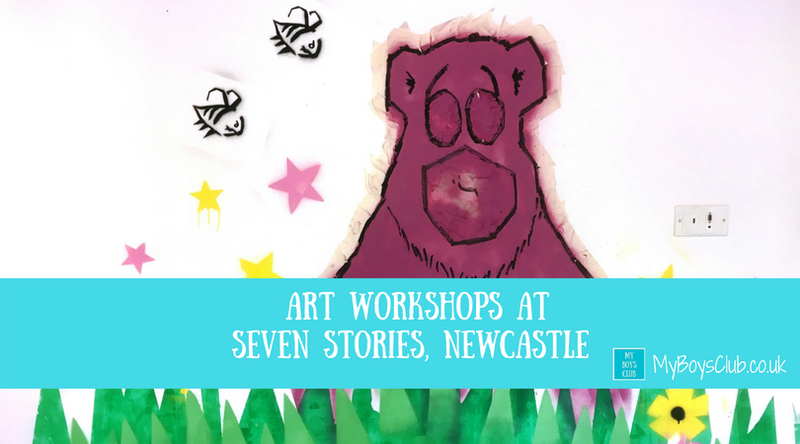 For more information and how to book these events please visit the Seven Stories website. Disclosure: We received complimentary admission for a family of four to Seven Stories and these workshops in return for an honest review. These wokshops look fantastic! Mt boys have always loved the 'You Choose' book, so I bet they'd really enjoy the new one.